The Puritans are still with us. 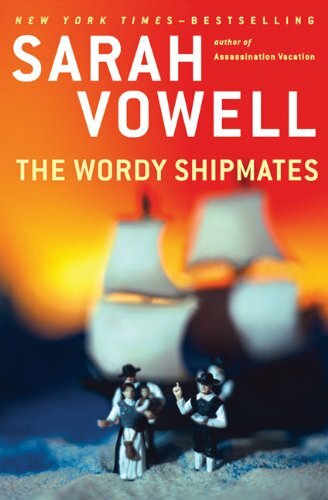 Such, at least, is the message of Sarah Vowell's latest book, The Wordy Shipmates. And indeed, the lesson seems born out by politicians and pop culture. While tourists traipse through a reconstructed Pilgrim village, presidents (and would-be presidents) argue about the meaning of a speech delivered almost four centuries ago—a lay sermon in which Governor John Winthrop proclaimed New England "a city upon a hill." Ronald Reagan added the modifier "shining," while Walter Mondale fruitlessly argued about the makeup of Winthrop's "city." Years earlier, John F. Kennedy turned to this same line on the cusp of his inauguration, and years later, hoping for a place in the White House, Sarah Palin touted American exceptionalism and quoted the sermon again. At the very least, then, this legacy of a city on a hill remains. But shining city aside, pop culture has not been kind to the Puritans. Instead, sit-coms and TV specials portray the Puritans as a fountainhead of intolerance, a source of religious fanaticism, a symbol of sexual repression. Well, Sarah Vowell would like to set the record straight. She begins with the legacy of exceptionalism (the idea that America is specially chosen and blessed by God). In the Academy (where I work), "exceptionalism" is an unqualified evil, a bogeyman, shorthand for blind intolerance—and not without reason. Providential exceptionalism can lead to things like the annihilation of the Indians (and the interpretation of such annihilations as blessed by God). The problem with American exceptionalism can be encapsulated by the Massachusetts Bay Colony seal, which depicts a Native American saying, "Come over and help us." That is the pitfall of this particular providentialism: that Americans could believe others always want our help (and that we have the help they need). Predictably, Vowell begins with just such a danger, running in one paragraph through the Mexican War, Wounded Knee, Vietnam, and Cuba, tracing each back to the Puritan belief that America is blessed by God and must therefore bring that blessing to the world (whether the world wants it or not). Winthrop's "city on a hill," in other words, is not just a model; it is the model, the one, true way. The beacon is so bright, it blinds. Yet Vowell does not stop at a knee-jerk fear of exceptionalism or a blanket condemnation of Puritanism. Instead, she asks what is worth admiring about the Puritans—and even what is worth keeping or retrieving. ("Is this not stirring?" she asks at one point, and later: "It is just me, or is this point still worth lingering over?") Winthrop's "city on a hill," for example, would ideally be a "model of Christian charity." In other words, when Winthrop envisioned a godly society, he did not turn primarily to governmental design; he turned, rather, to communal values, to loving one another, to rejoicing and suffering together, to living as members of one body. On 9/11, Vowell experienced precisely such a union, standing together with fellow Americans in a shared grief—standing, specifically, in the streets of New York and breathing the cremated and pulverized bodies of fellow Americans. Members of one body indeed. "[H]ere on the worst day of our lives," she writes, "I found comfort in the words of Winthrop. When we were mourning together, when we were suffering together, I often thought of what he said and finally understood what he meant." It is that deep meaning that drives Vowell to research and write about the Puritans: "Despite their unruly theology, their sometimes hair-trigger hate, the fact that the image of being members of the same body was so agreed upon to the point of cliché, makes [the Puritans] worth getting to know." But this beauty of community—that we could live and rejoice and suffer together as one body—also has its dark side: the requirement to conform, the surveillance, the excision of all that does not quite fit. "There's no agreeing to disagree in Massachusetts Bay," Vowell writes. "There is only agreeing to agree." And such enforced conformity entailed some rather severe punishments. Longing for the settlers to "think of themselves as members of the same body," Winthrop "orders a man's ears to be cut off." Yet even in the case of conformity, Vowell offers balance rather than the usual screed against intolerance. (In fact, she describes most popular versions of the Puritans as "diatribes about tolerance straight out of The Crucible, but with cornier dialogue and magical nose crinkles.") With each aspect of Puritanism, Vowell traces both the appeal and the danger, both the good and the bad. One positive aspect that Vowell details with delight is a respect for education. The Puritans were deeply committed to learning—a commitment so obvious and so interwoven into all they said and did that it is sometimes brutally shocking (as a scholar of Puritanism) to discover popular views that depict the Puritans as anti-intellectual fanatics. Some people build such views on a basic premise that religion itself is opposed to learning. That would come as a surprise to the Puritans. One of the first things they did after building houses was build a school (Harvard). Next, they established a printing press. It would not do to wait for books from England; they must publish books themselves. Yet even then they continued to spend enormous amounts of money shipping boatloads of books to a small colony situated on the edge of the frontier. In their struggle for survival, the Puritans considered learning a basic need.